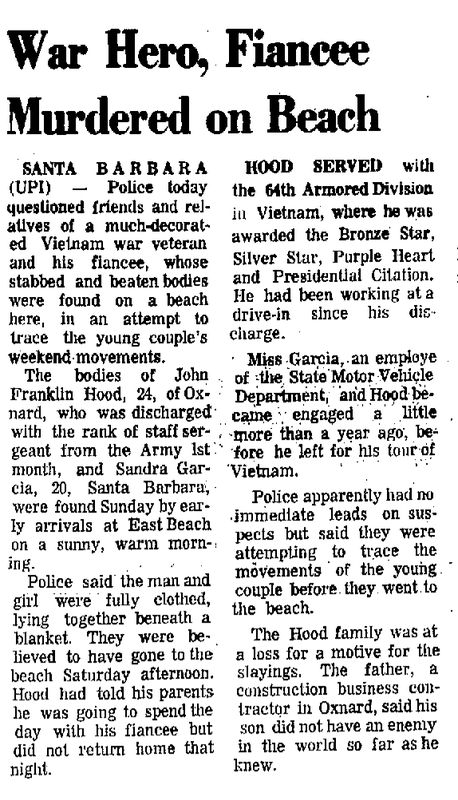 On Saturday February 21st 1970, John Franklin Hood (24), who had served decorated time in Vietnam in the 64th Armoured Division and Sandra Garcia (20), who worked in the California Department of Motor Vehicles, decided to visit the quiet retreat of East Beach, Santa Barbara one evening, where unfortunately they fell victim to a knife wielding assassin not unlike the previous murders of Robert Domingos and Linda Edwards, 34 miles miles west of this attack. This area of East Beach is close to Santa Barbara Cemetery and flanked by East Cabrillo Boulevard. Robert Domingos and Linda Edwards were brutally gunned down on June 4th 1963, near Lompoc, Santa Barbara County by an unknown assailant armed with a .22 caliber weapon, a knife and cut lengths of rope. This earlier crime, along with the murder of John F Hood and Sandra Garcia in 1970 seemed to bear some of the hallmarks of the Lake Berryessa attack on Bryan Hartnell and Cecelia Shepard on September 27th 1969, close to the Knoxville Road. Both Bryan Hartnell and Cecelia Shepard were stabbed repeatedly, at least sixteen times in total and although Bryan Hartnell would survive the brutal attack, Cecelia Shepard was not so lucky, finally succumbing to her injuries two days later at the Queen of the Valley Hospital. ​John F Hood and Sandra Garcia were shortly to be married and were enjoying the evening tranquility lying on a blanket under a full moon, when a man armed with a bone handled 4" blade approached them and shattered their dreams. Despite apparently fighting back against their attacker, both unfortunately had their lives cruelly snatched away on the remote Santa Barbara beach. John Hood suffered eleven knife wounds, the majority inflicted to the face and back, with Sandra Garcia receiving the brunt of the vicious attack, leaving her almost unrecognizable in what appeared a senseless and motiveless crime. There appeared to be no sexual interference and robbery was ruled out. The couple were discovered the following day, Sunday 22nd February, lying face down on their blanket. The bone handled fish knife used in their murder was retrieved from beneath the blanket, partially buried in the sand. Parallels have been drawn in all three of the above cases, all occurring in remote areas, all on beaches, lone couples the target, the use of rope, with robbery and a sexual angle seemingly not the motive. These murders came five months after the Lake Berryessa attack on September 27th 1969 and one month before the Modesto abduction of Kathleen Johns on March 22nd 1970. The Melvin Belli letter mailed on December 20th 1969 pleaded with the attorney for help, but warned of 'losing control again and taking his ninth or possibly tenth victim. Two months later John Hood and Sandra Garcia would be dead. Then a further two months passed before the 'My Name is Letter' arrived on April 20th 1970 and announced ' But there is more glory in killing a cop than a cid because a cop can shoot back. I have killed ten people to date. It would have been a lot more except that my bus bomb was a dud. I was swamped out by the rain we had a while back.' The question being; were John Hood and Sandra Garcia part of his victim count. The murders have been thought by some to be the work of the Manson Family, but former gang member Robert Beausoleil, serving life for the murder of Gary Hinman in 1969 as part of the 'Helter Skelter' revolution, has distanced himself from any involvement and no connection has ever been proven. Many crimes have been drawn into the Zodiac Killer timeline, often with little reason, however, the murder of John Hood, Sandra Garcia, Robert Domingos and Linda Edwards deserve a closer look. SANTA BARBARA (UPI) - Police today questioned friends and relatives of a much-decorated Vietnam War veteran and his fiancee, whose stabbed and beaten bodies were found on a beach here, in an attempt to trace the young couple's weekend movements. The bodies of John Franklin Hood, 24, of nearby Oxnard, who was discharged with the rank of staff sergeant from the Army last month, and Sandra Garcia, 20, Santa Barbara, were found Sunday by early arrivals at east beach on a sunny, warm morning. Police said the man and girl were fully clothed, lying together beneath a blanket. They were believed to have gone to the beach Saturday afternoon. Hood had told his parents he was going to spend the day with his fiancee hut did not return home that night. Hood served with the 64th Armored Division in Vietnam, where he was awarded the Bronze Star. Silver Star, Purple Heart and presidential citation. He had been working at a drive-in since his discharge. 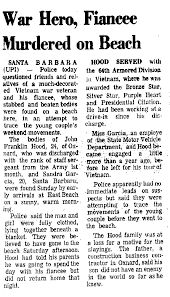 Miss Garcia, an employee of the State Motor Vehicle Department, and Hood became engaged a little more than a year ago, before he left for his tour of Vietnam. Police apparently had no immediate leads on suspects but said they were attempting to trace the movements of the young couple before they went to the beach. The Hood family w'as at a loss for a motive for the slayings. The father, a construction business contractor in Oxnard, said his son did not have an enemy in the world so far as he knew. Chris Schaffer, murdered on February 23rd 1970. Another crime to show parallels to this case was the double murder of Thomas Victor Dolan (17), of Manhattan Beach and Homer Clyde Shadwick (19), of Saginaw Michigan, also on a Santa Barbara beach on July 4th 1970 and just 11 miles west of the Hood and Garcia crime scene. Using blood pattern analysis and distribution to explain the story as it unfolded from the moment the killer requisitioned the taxicab in the theater district of San Francisco to the last possible sighting of the murderer. All four confirmed attacks by the Zodiac Killer fell on the first day of the week on the 13 Moon Calendar, but that was only the beginning. February 24th 1970: "Police Hunt Pair In Twin Murders Santa Barbara". Detectives today were combing their city for two young men wanted for questioning in the vicious knife-slaying of an Oxnard Vietnam war veteran and his pretty Santa Barbara fiancee. Detectives said the pair, both in their early 20s, were seen “washing cut wounds” at an east beach area service station near where the bodies of the couple, John Franklin Hood, 23, of 460 Helsam Ave, and Sandra Garcia, 20, of 3088 Calle Pinon, Santa Barbara, were found. Witnesses told detectives the two men walked into the station about I a.m. with cut wounds they said they had received as the result of a fight in the east beach area. Detectives said one of the men had a vertical cut across the center of his forehead, extending from his hairline to an eyebrow. The other man had a wound on the back of his right hand. They were seen driving an early 1950 vintage light blue sedan with primer spots on the right side and trunk deck. Pathological tests revealed Hood and Miss Garcia were killed sometime between IO p.m. Saturday and 2 a.m. Sunday. The tests were conducted by Dr. John P. Blanchard, pathologist there." Oxnard Press Courier, February 24, 1970.